Chris Middleton is an acknowledged expert on robots, automation, AI, and the IoT. He has written numerous articles and features for leading tech titles, appeared several times on the BBC and elsewhere discussing the impact of these technologies, and hosted major robotics conferences. In 2019, Chris helped lead an Expert Mission, on robotics and AI in extreme environments, to the US, on behalf of Innovate UK and the Knowledge Transfer Network. The week-long trip brought together a cohort of academics, startups, and blue-chip companies, such as Rolls Royce, and visited potential partners in California and Texas, including NASA. Chris is producing a detailed policy report for the government on the back of the Mission, and was involved in a similar trip in 2018, on digital health, after which he produced a 12,000-word report. Chris’ expertise in robots embraces humanoid machines, AI, industrial robotics, automation, the Internet of Things, ethics, human rights, employment, and robots’ impact on industries, such as manufacturing, healthcare, space exploration, nuclear decommissioning, and engineering. He has written about these for Computing, diginomica, Internet of Business, Citywire, Hack & Craft News, and the Digital Marketing World Forum, among many others. Along the way, Chris has interviewed some of the world’s leading robotics experts, including Prof. Hiroshi Ishiguro, and has appeared on national radio and international TV (see below), and in the press, such as in this article in the Evening Standard, and in The Sun. • You will find well over a dozen of Chris’ original reports on robotics and AI on the homepage of this site. • Links to many of Chris’ other recent articles are at the foot of this page. Chris has given speeches on AI and robotics at universities, schools, colleges, corporate events, exhibitions, and trade shows, and has helped several blue-chip companies to imagine the future and develop new business/tech strategies. In 2017, he hosted the event ‘Rise of the Machines’ for The Crowd, in London, and gave speeches on the business impact of robotics and AI at the Sensors Show (NEC Birmingham) and the UK Industrial and Logistics Summit (London). 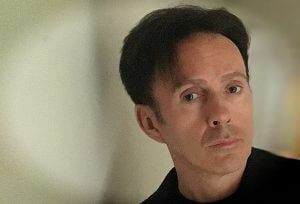 Chris has appeared as a robotics expert on BBC1 and ITN, discussing the societal impact of AI and automation, and has been interviewed live on Talk Radio, Radio 2’s Drive Time show, on Radio 5Live, and on several local BBC stations. In 2017, he was a panelist on a live podcast from the Brighton Digital Festival (link below). • If you would like Chris to help you develop or present robotics/AI content for broadcast, please get in touch. Chris has a collection of robots, including his famous NAO-25 humanoid, Stanley Qubit, and Joe Auton, a Robi robot designed by Japanese robotics legend Tomotaka Takahashi. In February 2017, Stanley Qubit made history as the first real robot ever to appear in a dramatisation of Isaac Asimov’s ‘I, Robot’ stories, on BBC Radio 4. The drama won two awards at the New York Radio Festival. • AUDIO: Stanley Qubit interviews actor Nick Briggs about his role in ‘I, Robot’. • AUDIO: Stanley Qubit interviews scriptwriter Richard Kurti about adapting ‘I, Robot’. In August 2015, Stanley Qubit co-hosted the BBC1 show Sunday Morning Live, with Sian Williams, and took part in a live debate on the future of intelligent machines, with musician/broadcaster Ana Matronic and playwright Bonnie Greer. 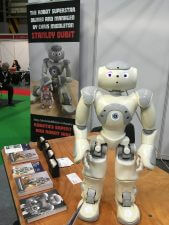 Chris’ robot business hires out Stanley Qubit and Joe Auton to PR companies, event organisers, exhibitions, technology providers, broadcasters, filmmakers, and schools. • The flying robots are coming! • Who is responsible for ethical AI? • The Political Algorithm: Who Guards the Guards in a Robot World?